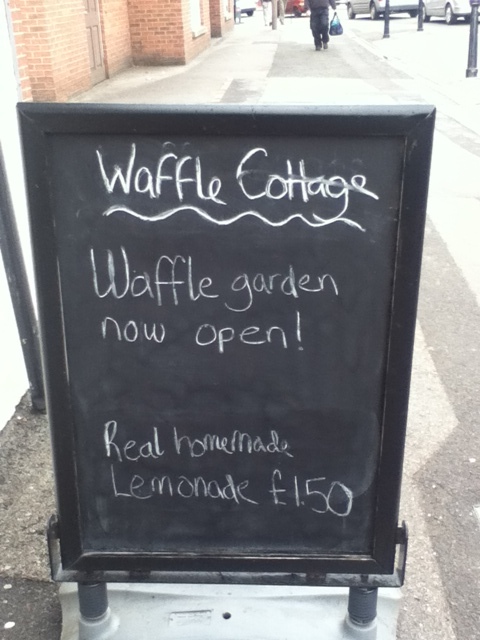 Waffle Cottage is at 57-59 Castlegate in Newark. We ate there this week during a brief pause on a food and beer hunting trip through Newark. I could claim that we had stumbled upon the place, but we didn’t, as for once I had done a modicum of preparation for the trip and had this joint well and truly on my radar. 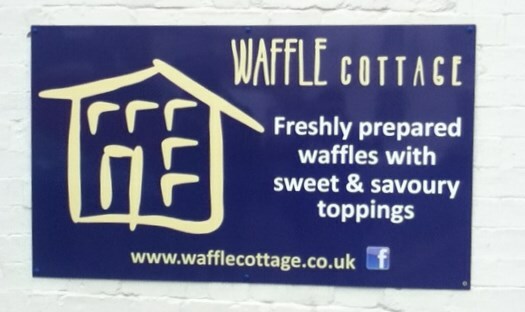 Waffle Cottage specialise in sweet and savoury American waffles cooked to order, and it was the savoury part of their menu that I was interested in. There were quite a few items that I had espied one that may not be so familiar to the UK was the “Sloppy Joe” which they describe as their own twist of an American favourite – basically steak mince in a bbq sauce topped with cheese. In the USA you normally get this served in a burger bun and it is very messy to eat, but extremely enjoyable. For the more traditional UK people you can order a waffle topped with a Full English Breakfast: sausage, bacon, egg, tomatoes, mushrooms and beans. That would be a good savoury waffle for a waffle initiation party. Myself and Martin had our eyes though on some more classic American toppings. 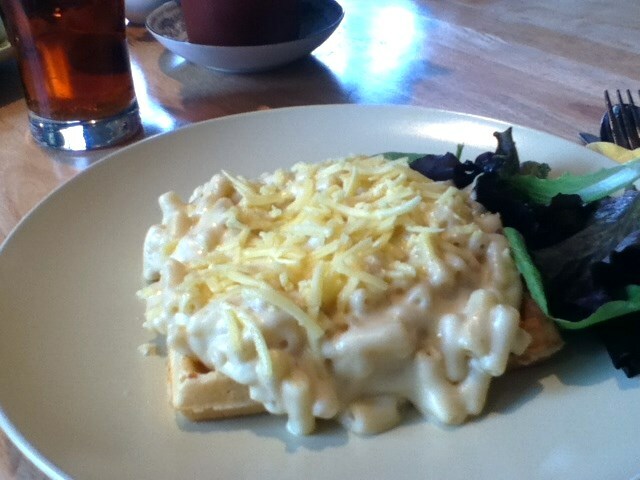 I went for the Mac N Cheese topped waffle for £4.25 which ended up being topped with a really creamy macaroni cheese in a cheddar and Emmental sauce. It was such a goddam cheese feast I did have to question if there were only the two cheeses in it. I have had 4 and 5 cheese macs in the states that were less tasty. My only doubt was the waffle, it did not seem crispy enough for me, perhaps that Mac N Cheese topping made it a little bit soggy. Thinking about it, it would be nice if the Waffle was cooked then crisped up on a flat top grill just to give it that salty crunch like a grilled cheese sandwich before adding the topping. OK that is just my imagination running wild for a brief moment, and I just made myself hungry in the process. I don’t really have any complaints about the dish, that cheesy mac was just spot on for me. 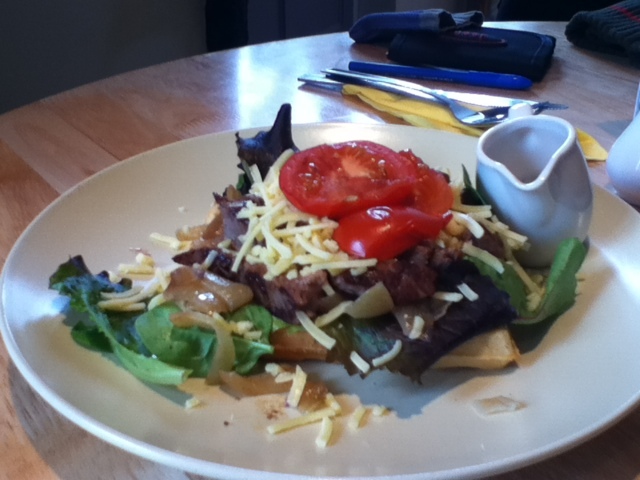 Martin ordered up the “Philly steak” topped waffle for £6.50 – this one is topped with caramelized onions, sliced grilled steak and tomatoes topped with melted cheese. If you have never had a Philly Cheesesteak then you will enjoy this all the more as you will have nothing to compare it with, if you have had one, well then this is more Philly Cheesesteak Style. It has all the components and the flavours but it is not quite the same thing as the meat is cut into small chunkier pieces as opposed to the really thin slices you get in Philadelphia. It brought back some happy memories though that we both had munching on several classic Philly Cheese steaks in the City of Brotherly Love a few summers back. A slightly tongue in cheek comment here would be that the cheese used by the Waffle Cottage was too good, every classic Philly Cheesesteak just needs Cheez wiz to make it perfect. On the 4th July they are running a Classic American theme with an American themed menu, including items such as “southern fried chicken with coleslaw and even a burgerwaffle“. I fancy a burgerwaffle, I have had a hot dog waffle and that really worked so this could be a genius move by Waffle Cottage if they can pull it off. On the 25th August to celebrate International Waffle Day they are celebrating it ‘by offering waffles from around the world with yummy toppings such as beef sate and nasi goring from Malaysia and sweet and sour pork from China.’ That does sound intriguing! We had a pretty good natter with the owners and he had been living over in the States for a while so we were both on the same page waffle topping wise. I tried to persuade him that a classic bacon topped waffle with maple syrup was really needed, but he was a little unsure that the Notts folk would be keen on that. If you go in, just ask him for one, and then maybe if enough of us do he will put it on the menu. 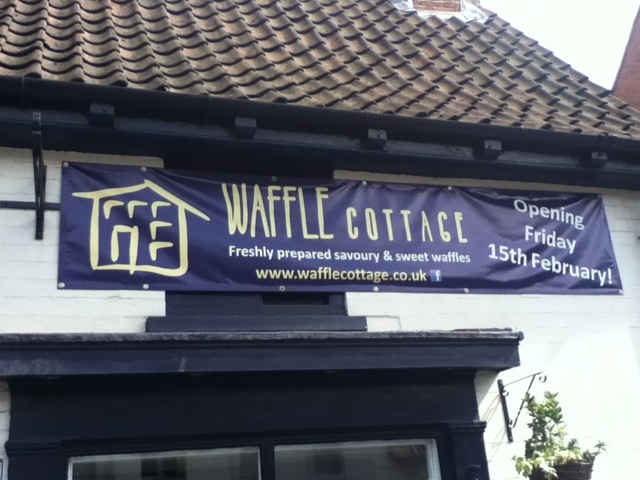 To find Waffle Cottage , head over towards the Castle at Newark and it is located on the main road at 57-59 Castlegate. Next Post The Castle Barge Pub – What is better than Beer on a Barge? Beer AND Pizza on a barge!